We have morning and afternoon Nursery sessions at The Grove; The teacher is Mrs Read with four Early Years Practitioners Mrs Littlefair, Miss Wilding, Mrs Tomic and Mrs Sriram. Welcome to the Nursery blog. We will update our page weekly to share with you some of our learning and experiences that happen throughout our week and remind you of upcoming events. We have really enjoyed talking about Spring this week. We have all been on a Spring walk and have used clipboards to draw what we haven seen. We took some lovely photos too. In the Creative area we were using all different types of materials to make flower pictures. The children have kept a close eye on our growing projects. The beans are growing well and the carnations are changing colour in the different coloured water. We are looking forward to our Mothers Day Tea on Monday! We have now learnt all about penguins and have decided that it is time to send our penguin back home. We have enjoyed his stay and he has enjoyed his visit. We have found out where his home is and have now popped him back in his box and put on the correct delivery label. We had great fun on Thursday with Carl. He ran a 'Kidzfit' workshop. We did lots of exercise, it was great fun! We learnt a lot about keeping healthy too! Next week we are going to be enjoying Spring and learning about how our environment is changing. The children that went to forest school collected some lovely natural objects this week. We froze them in some ice and it looked really good. The children experimented with the ice, putting them in different places to see where they would melt the quickest. The weather was not great so the ice outside took quite a while to melt! This week we used our imagination to make up our own penguin adventures. We used materials and objects to make the setting. The children had great ideas. In the creative area the children made bird feeders using seed and lard. We hung these around the nursery garden hoping to invite the birds in over the spring time. We hope the wind doesn't blow them away! Next week we are going to be talking about keeping fit and healthy. We have a 'Kidzfit' workshop. We use this company most years and look forward to a fun filled action packed workshop! We had a mysterious delivery this week! A penguin arrived in a box!! The delivery address was ripped off so we need to work out where it has come from and how to get it home. We are using information books and the computer to find out about penguins so we can care for it. We have also used clay to make penguins, pinching the beak. We have had a fun week! We began the week with our Chinese New Year Dance which was postponed due to the snowy day. It was great fun. We danced with fans and had a go under the lion costume! As it is book week, we have been looking at Jack and the Beanstalk. We read the story and had a go at cutting out spirals to put together to create a really high beanstalk. We have also planted a bean hoping it will grow as high as the one in the story. This week we also popped into other classes in the school to listen to lots of different stories read by different teachers. On Friday we all dressed up as a book character. We were very excited to discover a frog hiding in the Nursery garden. We talked about where he might leave and what he might need. Next week Hedgehogs have forest school on Monday. This week we've been having fun with the story 'Little Red Riding Hood'. We have all made some vegetable soup just like Red Riding Hood did for her Granny. We chopped and peeled the vegetables. Most of us thought it was delicious! We had fun looking at the programmable toys and working out how they move. Next week we will look at the story of 'The Three Little Pigs'. The Chinese New Year Dancers have been rescheduled to the Monday after half term. We have really enjoyed finding out about Chinese New Year! In our focus time we have been tasting Chinese food, making up dragon dances and re-enacting the story using animal masks. Tomorrow we look forward to watching the real performance in the hall. This week we have also been making the most of the sprinkling of snow. We have been leaving out pots of water adding sequins and seeing if they freeze overnight. Next week we will have a session on programmable toys. Please can your child bring in a toy that has buttons and levers etc. We have enjoyed listening to the story of 'Goldilocks and the Three Bears' this week. The children have made their own oat play dough by mixing flour, oats and water. We also used the porridge oats to make some yummy flapjacks. We gobbled them up at snack time, they were delicious. In Maths we have used the Goldilocks story to help us order things by size. Outside the children decided to block the door to the bears cottage so Goldilocks couldn't come in. As part of our Physical Development we took part in 'Super-hero training'. We are working hard on our arm muscles to help us become good writers. This week Mrs Read brought her car to the Nursery. We pretended it was the 'Bat Mobil' and used our arm strength to make it shine. Thank you for coming to the 'Information Meeting'. You will receive the notes soon by email. Happy new Year to you all! We hope you had a lovely Christmas break. We are so pleased with how quickly the children have settled back into Nursery. We have heard all about their Christmas break and have enjoyed listening to them telling us what they got for Christmas. This week we began our new topic of Traditional Tales. We looked at some of the children's favourite books. On Friday we discovered a bit of a commotion in Nursery.......we found three different sized chairs, one was broken. We found three bowls of porridge, one was empty! There were lots of funny footprints too. Together we tried to solve the mystery and worked out who we think did this. Goldilocks!!! Over the break our caretaker fitted our water wall on the side of our Nursery building. The children have loved exploring with the water. Remember next week we have our information meeting on Thursday! Mrs Tomik started with us this week. She is working with Red group (pm). Mrs Sriram is now working mornings only. We have had great fun this week. We enjoyed our party, we danced, played games and had a special visit from Santa. We loved decorating our biscuits too. This week Nursery have used the running track around the field and some of us even managed three laps!! Superstars!! We would like to thank one of our Grandparents for making our 'Music Wall' frame. We have tied on saucepans and other things that will make great sounds. Thank you all for supporting us in our first term at Nursery. We hope you all have a magical Christmas and we look forward to seeing you in the new year! Term starts back for the children on Tuesday 8th January. Another fun week for us in Nursery! We all took part in some Elf Training! We practised throwing presents into Santa's sleigh! We wrapped presents too. This week we made our Christmas Cards and had a go at writing our names on the inside. We loved performing our Christmas songs to you. Thank you so much for coming and for providing the children with fabulous outfits. Squirrels had their last Forest School session and made bird feeders for the birds. Next week we look forward to our party on Monday. No need to bring anything, the children just need to turn up in their party wear. Tuesday is family evening, come along and have a look around the Nursery and the school at all the things the children have been making over Christmas. We have continued with our Christmas festivities this week. The children have been using props to act out the Nativity. We have made tree decorations which I am sure you will love to put on your trees at home. The children have been going to the hall to practise their singing which we will perform to you next week. (Thursday) I apologise if there was any confusion with the bringing in of outfits. Just to clarify, morning children can come to Nursery in their outfits, afternoon children can bring their outfits with them on the day in a bag. We had great fun outside this week (despite the rain) we made a sleigh for Santa. The children thought carefully about how it was constructed as we didn't want any presents to fall out the sleigh! Some children were busy transforming the hobby horses into reindeers to pull the sleigh along! This week you have been emailed a questionnaire regarding the Nursery settling in period. Please fill these in by Friday 14th December. Please ask a member of staff if you would like a paper copy. It's beginning to look at lot like Christmas!! We have started our Christmas activities this week. We have listened to 'The Christmas Story'. The children are learning our songs well and are preparing to perform them to you! (13th December) You will hopefully have received a slip of paper this week which tells you what your child needs to wear. We hope that you don't need to buy anything, please let us know if you are having trouble finding the right colour top etc. If your child attends Nursery all day, you can choose which performance to come to, morning or afternoon. If you have booked a holiday in term time and have let the office know, please let the nursery staff know as well so we are fully informed. Thank you. As we are a healthy food school we will no longer be giving out sweets for birthdays. If your child would still like to bring something to celebrate their birthday with their friends, we are suggesting a small cake or biscuit that the children can have at snack time after they have eaten their piece of fruit or vegetable. We also ask that if you wish to bring a snack for your child at the end of the school day that it is not sweets but a healthy snack! Exploration area: we spoke about what our senses are and what we can use them for. We then went on a senses walk around the school, stopping to listen, look, feel and smell the things around us. 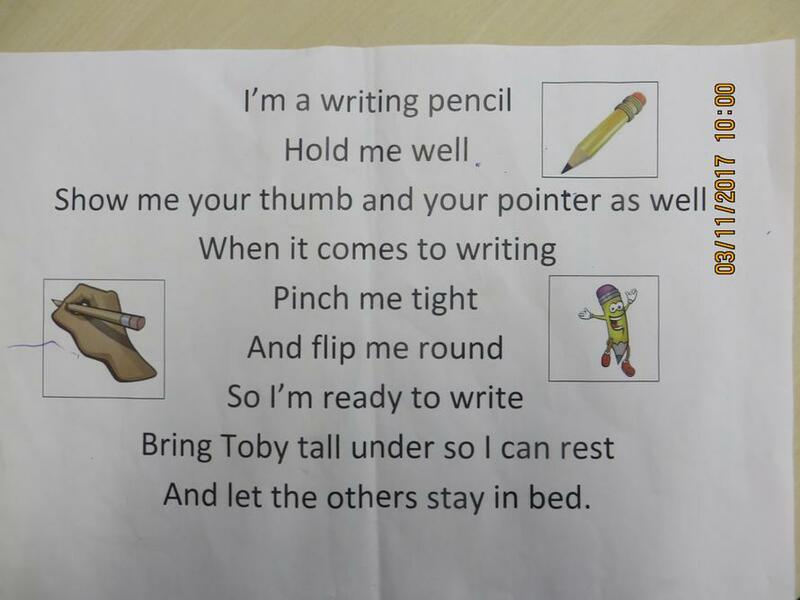 Numbers and letters area: we learnt a new song to help us hold our pens. We practised by drawing pictures and writing our names. Creative area: we played ‘guess the sounds’ using pots of different objects, such as rocks, rice etc., talking about similar sounds and whether they like them or not. This week we had two healthy workshops. Our first was 'I know why it's yum, Mum!' where we learnt all about fruit and vegetables and why they are good to eat! Our second workshop was ‘kids fit’ we did 45 minutes of different exercise it was lots of fun!! Throughout the nursery we have had a variety of healthy eating activities for the children to choose from, for example-sorting healthy and unhealthy foods, observational drawings of fruit and fruit and veg in our sensory trays. Creative area: the children made farm animals our of paper plates. The children were show pictures to help them and were encouraged to work independently. Numbers and letters area: We read the story of ‘The Three Billy Goat Gruff’. The goats wrote us a letter asking us to help them find a way of getting yummy grass to eat without having to cross the bridge. The children were encouraged to use their problem solving skills to help the goats. Exploration area: we spoke about what makes us healthy, and then we played a game of ‘tails’. Some children had ribbons to be the sheep and some were the sheep dogs who had a catch the sheep. We then observed the effects of running around on our body. Exploration area- the children used the large construction and den building kit to help Rubble build houses and shops. Numbers and letters area- the children looked at signs in our environment. They looked at shop and restaurant logos and drew their own shops and buildings to create a town. Creative area- the children looked at famous land marks and buildings. We spoke about what they were made of, how big or small they were and what we thought they were made of. They then used small construction to build them. Exploration area- the children were introduced to floating and sinking. They had the opportunity to explore a variety of materials and where encouraged to use words such as floating, sinking, floats and sunk to describe what was happening. Numbers and letters area- the children worked on their pencil skills by making a wave picture. The children drew along zig zag, wavy and bumpy lines. They also worked on their name writing. Creative area- we used different materials to make a boat for Zuma. The children were encouraged to talk about what they had chosen and why. Did it make a good boat? Why/why not? Exploration area- we looked at a few x-rays of human bones. We spoke about what x-rays are for and what the doctors would need to do if we broke a bone. Numbers and letters area- we spoke about what we would go to the doctors for and if we had ever been to the doctors. The children used Role-play dressing up and doctors kits to help make their friends feel better. Creative area- we spoke about germs and the different ways we can make our hands clean. The children had the opportunity to use different soaps to clean their hands. They also made paint germs and added eyes. Exploration area- we were firefighters this week. We spoke about how they have to work as a team and help each other. We then completed an obstacle course helping our friends if they needed help along the way. When we got to the end we used the water squirters to put out the ‘fire’ and the hose to put out the ‘fire cups’. Numbers and letters area- we wrote thank you cards/ letters to the police officer and the firefighters who came for our visits. Creative area- we used junk modelling to make fire engines. The children used different techniques to join all their pieces together. In the morning nursery we were very lucky to have a visit from Williams’s dad who is a firefighter. He brought in some of his equipment and uniform to show us. In the afternoon nursery we had a visit from the fire engine and fire fighters. They showed us some of the equipment and different parts of the fire engine. next weeks topic is doctors and nurses. This week the children have been showing us what they can do. Creative area- this week the children have been showing us their cutting skills. 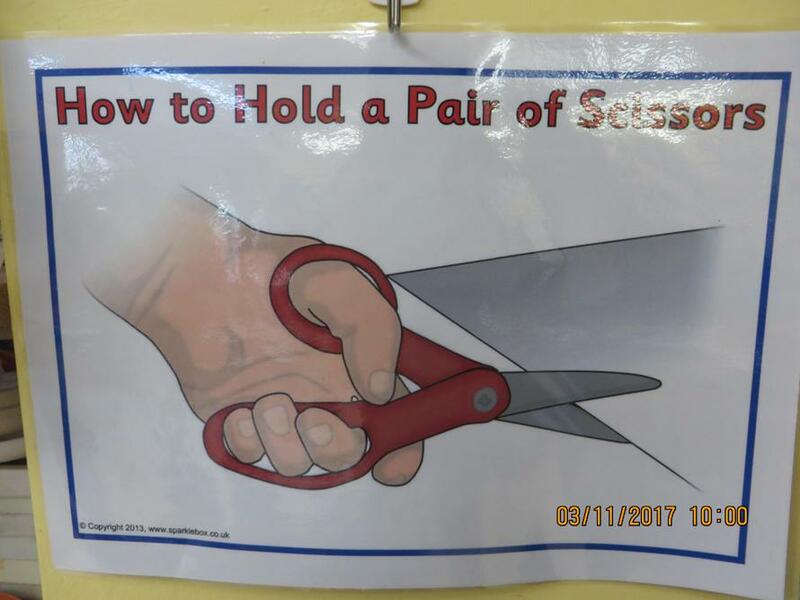 We have been reminding them how to hold their scissors when cutting and how to hold them safely when walking with them. In the exploration area this week the children have been practicing how to put their coats on by themselves. They have also been showing us their fine motor skills. In the numbers and letters area we have been learning how to hold our pencil. We sang a song to help us then had a go at a fine motor picture. We also used star stickers to add the right number of stars to number rockets. Please could all yellow group children bring in a pint sized milk bottle for next week (w/b 6.11.17) thank you. This week we have been learning about the festival of Diwali. We listened to the story of Rama and Sita, and acted out the story together. In the creative area we made Diva lamps using paper plates. We coloured them in and added decorations. In the numbers and letters area we looked at Rangoli patterns. We used different shapes to create our own Rangoli patterns. In the exploration area we were exploring with colours and how they can be changed. The children went on a colour walk, then used powder paints to colour mix. Mrs Sriram’s daughter came in and performed a traditional dance. Next week we will be putting out sign-up sheets for you to choose a slot for consultations which are after half term. In the creative area this week each group created an underwater scene. We used lots of different media to create our pictures, for example, paint, tissue paper, coloured sand, sequins and coloured paper. In the exploration area this week we explored water and ice. We had coloured water in the water tray and water ways. We had a race to see who could melt their block of ice first. It was lots of fun but very cold! In the numbers and letters area this week we were adding scales to rainbow fish. The children had to recognise the numeral on the fish and add the right number on scales. We also added one more scale to the fish. The children were then asked to count all the scales on the fish and have a go at writing the numeral next to the fish. In the Exploration area this week we went on an animal hunt. We were given clues as to where the animals were hidden; the children were then given a challenge to complete before we collected the animal. The children then told us what they knew about the animals we had found. In the numbers and letters area this week we drew pictures of our favourite wild animal and had to add a background that would camouflage the animal. The children were asked to think of something they would like to find out about the animal they had drawn. We then used the internet to find out the answer. In the creative area this week we created camouflage pictures. The children had the opportunity to create their picture using collage materials, with paint or pencils. The children then added their animal to the picture to see if it was camouflaged. We had lots of fun on our art day, we especially enjoyed getting really messy!! !